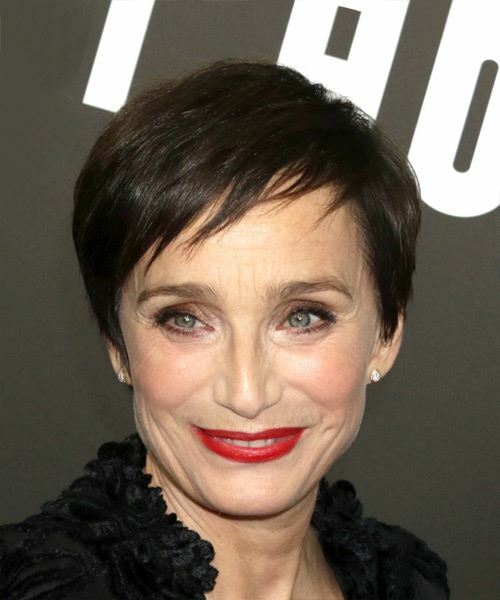 Kristin Scott Thomas looks chic in this jagged cut pixie that shows off her best features. The back and sides of this espresso brown 'do is tapered close to the head blending into the top lengths that are left longer and jagged cut, while being worn swept to the side. This hairstyle is best suited to those with fine to medium hair and delicate facial features. Only a small amount of product is needed to pinch through the ends and regular trims will help this hairstyle maintain its shape. Use styling wax to piece the front layers across the forehead and add texture all over.